Cambridge have named Steve Thompson as their new boss in succession to Herve Renard, who was sacked two weeks ago. 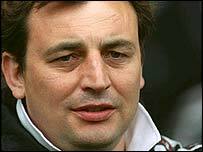 Thompson has managed Sheffield United, Southend and Lincoln, and coached at numerous other clubs including Newcastle, Doncaster and Notts County. Chairman Gary Harwood said of the 49-year-old: "Steve is under no illusion of how difficult a task he faces. "But he is looking forward to the challenge and is confident the club can maintain its league status."